Walks through villages and towns steeped in Mediaeval and Renaissance history, or excursions on foot, horseback and mountain bike through a fantastic variety of natural landscapes. Cagli stands on the site of Cale, an ancient Roman city situated on the Via Flaminia, the consular road linking Rome to Fano and ending at Rimini. An imposing bridge, the Ponte Mallio on the River Bosso has survived from this period. Cagli then became an important Byzantine town and, following the Goth and Lombard invasions, it was conquered by the Frankish King Pepin the Short, and subsequently ceded to the Papal States (AD 756). In 1289 Pope Nicholas IV reconstructed the city after it had been destroyed by an earthquake. The innovative urban design was later to inspire the architect Leon Battista Alberti when he worked on the design of the “Ideal City”. Cagli then became an integral part of the Duchy of Urbino, and Duke Federico da Montefeltro had it fortified (1481) by Francesco di Giorgio Martini, the greatest military architect of the age. The imposing elliptical-plan Torrione survives and now houses a centre for contemporary sculpture. In the same period large-scale redevelopments transformed the Mediaeval buildings, such as the Palazzo Pubblico, now the Town Hall with an archaeological museum, and many palaces, such as the Palazzo Castracane, which houses an art gallery with works from various periods, including drawings by Canova. The Teatro Comunale is a splendid 19th-century building. In 1901 it was the second theatre to be lit by electric energy after the Teatro Rossini in Pesaro. Cagli’s art treasures, paintings and frescoes from various periods by major artists, such as Giovanni Santi (Raphael's father), adorn the Mediaeval and Renaissance churches. 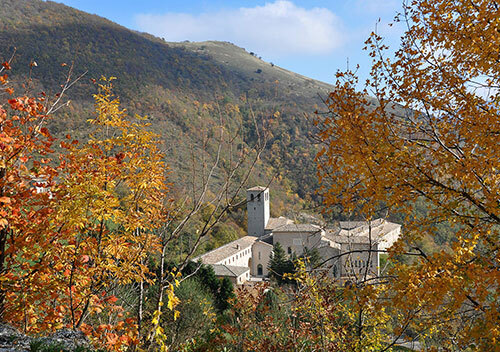 Today Cagli is still a beautiful town offering visitors the opportunity to explore history, art, architecture and excellent cuisine in the unspoilt natural setting of the some of the finest mountains in the Apennines. Their uncontaminated rivers form natural swimming pools, such as the pools of the River Bosso, providing unforgettable spots for bathing and swimming. Federico da Montefeltro, Duke of Urbino for over forty years, was a paragon of the Renaissance prince. A leading figure in Italian life in the 16th century, he was not only a great military general but also a cultivated humanist. He commissioned the architects Laurana and Di Giorgio Martini to construct his residence – "a city in the form of a palace" – which according to Castiglione was "the finest that can be found in all of Italy" and also the first example of an architectural and urban development harmoniously set in a natural landscape. The city has preserved all the magnificence of that period and the Ducal Palace testifies to the extraordinary standards that were achieved. The palace has 200 spacious, well-lit rooms designed for “the noblest minds”. After the Dark Ages, the palace was built with a new conception of living in a light-filled environment. Today the upper floors of the immense building house the National Gallery of the Marche, which boasts numerous masterpieces from the 14th century on, such as Saint Catherine and La Muta by Raphael, the Flagellation of Christ and the Madonna di Senigallia by Piero della Francesca, the Miracle of the Profaned Host by Paolo Uccello, the Crucifixion and Pentecost by Luca Signorelli, the Last Supper and Resurrection by Titian and many other invaluable works by artists such as Giusto di Gand, Piero Verrughete, Federico Barocci, Giovanni Santi (Raphael's father), Bramantino, Carlo Crivelli and Luca della Robbia. Raphael, the great painter and architect, was born in Urbino in 1483 to Giovanni Santi and Magia Ciarla and became a leading figure in Renaissance culture together with Leonardo da Vinci and Michelangelo. Now a museum, the house in which Raphael was born is a typical example of 15th-century residential architecture for a moderately wealthy family. Visitors to the house are immersed in the highly stimulating, original atmosphere. The works on show include a fresco with the Virgin and Child, thought to be the young Raphael’s first known painting: the face that Raphael gave to the Virgin in his own room may well be that of his beloved mother, who died prematurely. Raphael’s father Giovanni Santi, a greatly esteemed poet and painter at the court of the Montefeltro, introduced his son to the world of art. The other works in Raphael's House include a large Annunciation by Giovanni Santi, a Madonna attributed to Giulio Romano (Raphael's favourite pupil), copies of various works by Raphael, prints, drawings, etc. 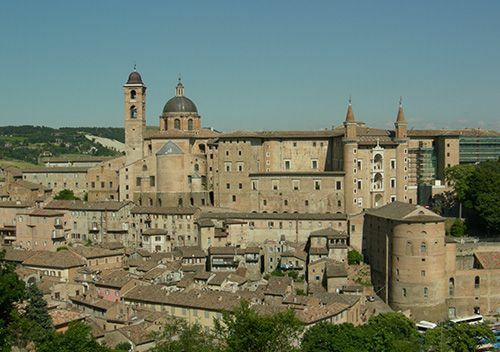 Just as Urbino represents the Renaissance, Gubbio is the quintessential Mediaeval city. 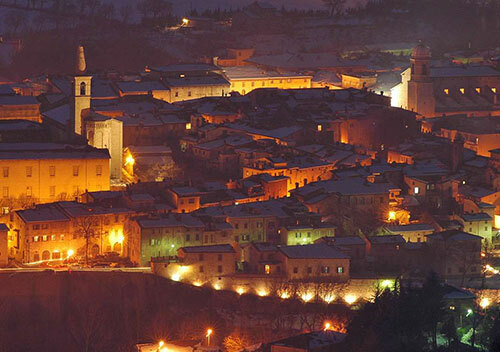 Rich in history and monuments, it has fascinated writers such as Gabriele D’Annunzio and Herman Hesse, who commented that the town "produced an absolutely astonishing effect and has something unreal and exciting about it". 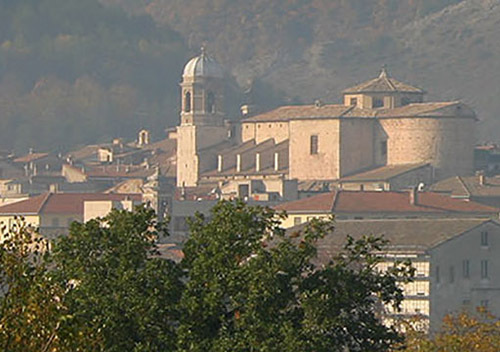 Gubbio has a very ancient history, as evidenced by numerous Bronze Age finds, the remains of a Roman theatre (late 1st century BC) and the Tavole Eugubine dating from the 3rd to 1st century BC. These seven bronze plaques with inscriptions in Umbrian, now in the Civic Museum, are considered one of the most important documents of the Italic peoples. But today the overwhelming impression is that of a remarkable Mediaeval city, with an urban layout dating from the age of the Communes. The buildings and monuments have survived intact and are totally dominated by one material – stone. 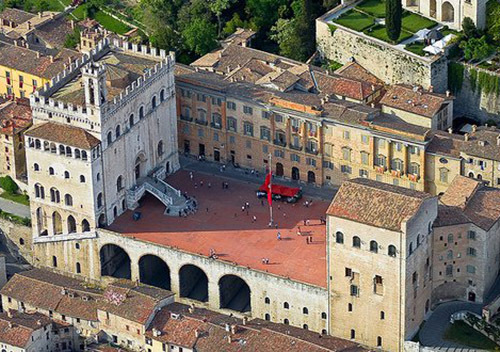 Any visit to Gubbio must take in the magnificent monumental complex of the Piazza Grande (late 15th century), also called Piazza della Signoria, with the Palazzo dei Consoli, an imposing Gothic building completed around 1340, now the Civic Museum, and the incomplete Palazzo del Podestà, now a municipal residence. 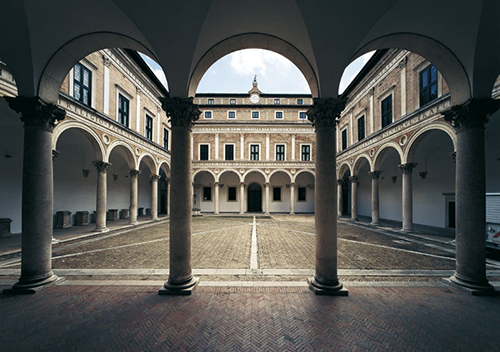 Commissioned by Federico da Montefeltro, the magnificent Ducal Palace was built to a design by Francesco di Giorgio Martini. 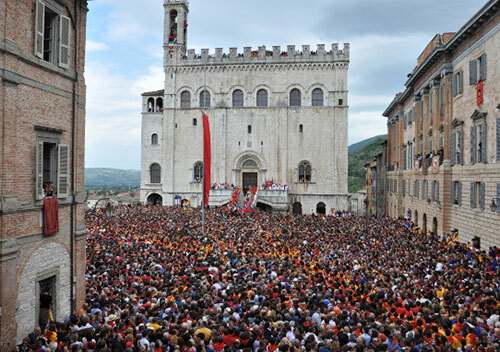 Other things to see include the six gates in the massive city walls, constructed in the late 13th century, the Basilica of Sant'Ubaldo, which can be reached by cable car, and the many churches and palaces making this town quite unique. Lastly, not to be missed is the nearby Gola del Bottaccione with its historic remains from various periods, the mediaeval aqueduct, the hermitage of Sant’Ambrogio and the church of Vittorina (13th century) which, according to tradition, was built where Saint Francis met the wolf of Gubbio. 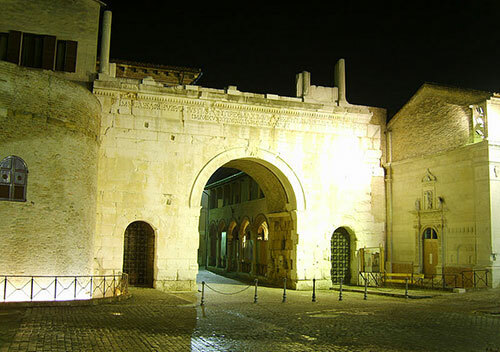 The urban layout of Fano still reflects the ancient Roman city, with its massive walls joining up with the Arch of Augustus, the ancient entrance to the city from the Via Flaminia, constructed by the Consul Flaminius. The consular road crossed Fano and then continued to Rimini, thus joining up Rome with the Adriatic and Northern Italy. Near Fano, along the banks of the River Metauro, in 207 BC Roman legions defeated the Carthaginian army and killed the commander Hasdrubal, who having crossed the Alps with his elephants was attempting to join up with his brother Hannibal. Fano has some important Roman finds in the Archaeological Museum. The collection of statues, busts and heads includes a splendid female head with an “Ottavia” hairstyle, the Gracchi Cippus and mosaics, such as Neptune and a Panther. 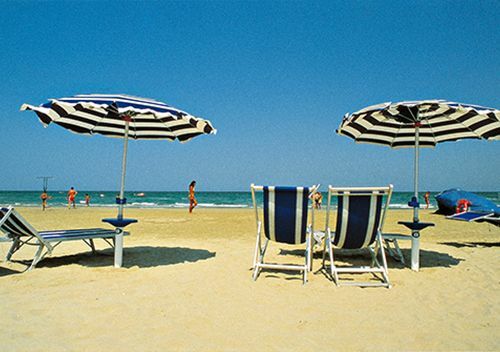 Fano is an excellent seaside resort with long sandy or pebbly beaches. It has won awards for the quality of its bathing facilities, seawater and air. With a large pedestrian precinct and cycle tracks, the whole city is eco-friendly. Il Pesce Azzurro. Opened many years ago by a fishermen’s cooperative with the aim of promoting and cooking pesce azzurro (sardines, mackerel, anchovies, etc. ), this self-service restaurant is situated in the port and seats up to 950 people. No frills, plastic cutlery but excellent food. Prices are very economic and all the dishes very tasty. 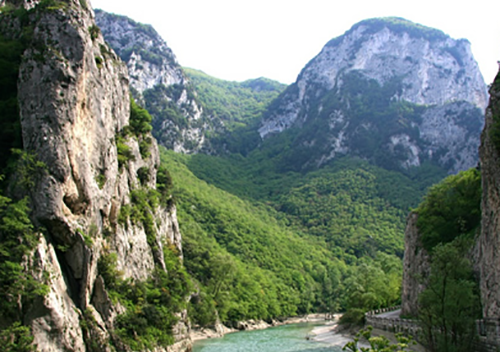 The Gola del Furlo State Nature Reserve stretches over 3,600 hectares of woods, grasslands and mountains. 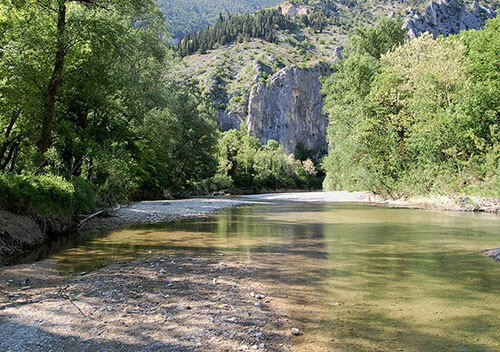 The River Candigliano flows past the dramatic massive rock faces of the gorge in this genuine paradise with stunning scenery and remarkable species of fauna and flora: golden eagles, peregrines, eagle owls, wolves, wild goats, deer and wild boar. the ancient stone-paved Via Flaminia was constructed through the gorge. Later Flavius Vespian had a tunnel gouged out of the rocks, completed in AD and still open to the traffic. The Via Flaminia today is a stunning road sunk between towering rocks and running alongside the river, where visitors can enjoy quiet walks or bicycle rides. The Reserve’s Nature Education Centre provides information and excursions (including a route to watch nesting eagles with binoculars). 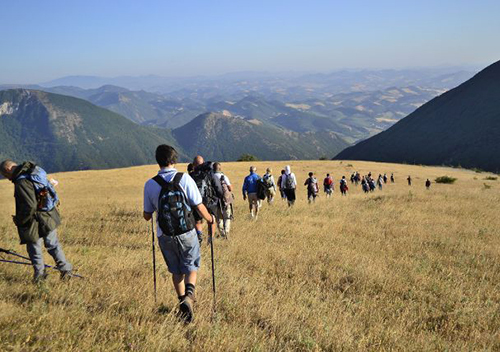 Although Monte Petrano (1,162 metres) is the lowest of the main peaks of the Pesarese Apennine, it has a fascinating appearance with a plateau of unending grasslands at 1,100 metres up. From the top of the mountain you can enjoy spectacular views of the whole of the Province of Pesaro and Urbino as far as the Adriatic Sea to the east, Monte Carpegna and the towers of San Marino to the north west, and the wooded mountains of Umbria to the south. The summit can be easily reached by road from Cagli and offers facilities such as a restaurant, bar and equipped camping area. 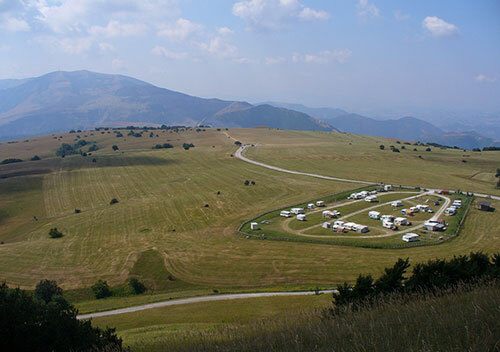 Monte Catria (1,701 metres) is the highest peak in the stretch of the Apennines from Monte Vettore (2,476 metres) in the Sibillini Mountains to the south, to the Corno alle Scale (1,945 metres) in the Bolognese Apennine to the North. The great massif of Monte Catria can be explored on beautiful paths or by going up a road almost as far as the peak, with its vast panorama of central Italy and the Adriatic. On arriving at the monastery, you are immediately struck by its original architecture, history and beauty in which the dominant note is simplicity. The constituent rock of the building has created a unique habitat and on entering the monastery rooms, spacious libraries, cloisters, gardens and, especially, the monks’ cells, you experience a profound silence and an intense spiritual energy. Today the monastery is home to a small community of monks who will take you on guided tours of the building and the botanic garden. Monte Catria can also be reached by cable car and has become a remarkable “outdoor gym” for all kinds summers sports: mountain bike, trekking, downhill biking, Nordic walking, etc. Situated at 1,400 metres up, the Cotaline Mountain Refuge, near the cable car terminus, has an excellent restaurant, solarium, bar and guides for excursions. The thunder peals below them distantly. 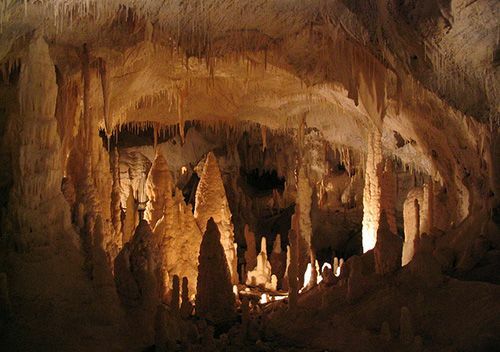 The Frasassi Caves were first opened on 25 December 1971, when the Grotta Grande del Vento was explored. The caves soon turned out be an enormous labyrinth of interconnected underground chambers stretching for over 30 kilometres. 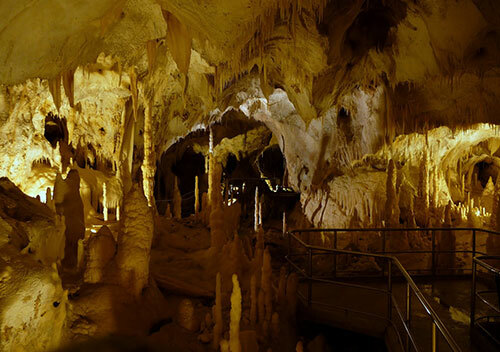 The caves are one of the most remarkable attractions in the whole of Italy. Thought to be the largest underground complex in Europe, they have a set of underground paths covering all 30 kilometres, and are divided into eight different geological levels. The Frasassi Caves are famed for their stalactites and stalagmites, centuries-old calcareous formations with incredibly varied shapes. They are a very popular destination with speleologists and nature lovers. 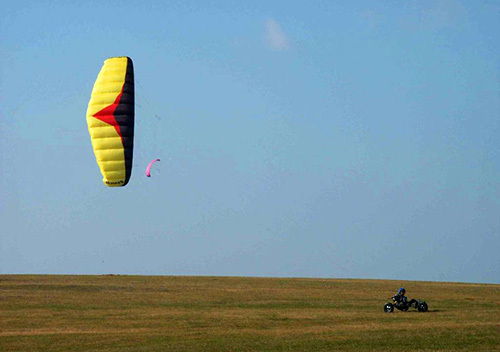 Only 1.5 of the overall 30 kilometres are open to the public and the temperature is never higher than 14°C. When visiting the caves you can choose from various paths, classified according to length and difficulty; e.g. a tourist path, a potholing adventure route and a school itinerary. The caves are open all year round. Il Posto delle Viole is an elegant country residence in Le Marche Region. Discover our services: the restaurant, wines and typical products, the riding school and horseback excursions, and the wellbeing centre – all for guests only.